You must make reservations at least 5 minutes in advance of the time at Giammarco's. We also offer Off-Site Catering services. We will deliver hot, freshly prepared trays off food. We can help set up and stay to serve if you like. There are many options to make your event great! Let us do the work so you don't have too. If you want to taste the finest Italian cooking with authentic Italian flair, Giammarco’s is the place to be. 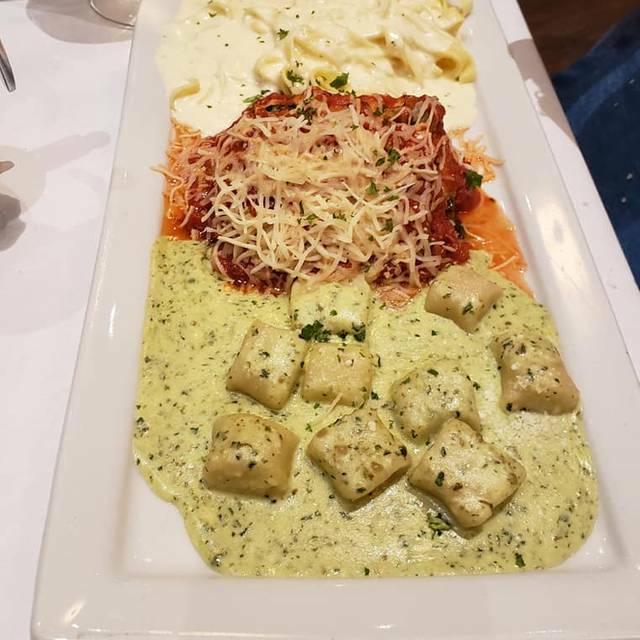 Voted the number one spaghetti and lasagna by the Columbus Dispatch, Giammarco’s offers freshly prepared dishes made to order. We use the finest and freshest available ingredients and our age-old family recipes. Relax and enjoy a glass of your favorite wine or beer while we hand roll your pizza or stromboli or individually sauté your specialty entree. Our goal is to create a delicious and memorable dining experience that will keep you coming back again and again…bon appetito and enjoy! We always love the food there. Their veal Parmesan is awesome, as are there homemade pastas and the marinara sauce is incredible. My wife loves the Alfredo, so fresh. Great bread and dipping oil, warm, fresh with a nice crunch. Sometimes the service is a bit iffy, but never enough to ruin the experience; more often it’s solid. A great choice for authentic Italian. The manager was rude. He said we had a 45 minute wait and did not care that we had open table reservations. He was not helping any of the staff. When the owner came in he started to bus tables . I understand that he was the owners brother. Caught them on prom night. seemed like they were a bit overwhelmed and understaffed. As always the food was great, service was wonderful - even highly impressed my finicky brother-in-law. Five star rating!! Wonderful and authentic pizza! Nice fresh salad and great bread plate. The spaghetti and meatball entree was excellent. The service with Nick was GREAT!! He was friendly, efficient, courteous and just a wonderful server. The staff is great. The best Italian restaurant around!! Spaghetti was delicious and salads were spectacular! Service with Ashley was wonderful! Again, an excellent dinner, with superior service from Cookie! Also, many thanks for correcting my problems with the awards site!👏👏👏👌 See you soon! Chicken parm was excellent! Service was the slowest I have ever experienced there. Very unusual considering the restaurant wasn’t really crowded. Excellent food and service. Very authentic menu with a wonderful atmosphere. Service was excellent! Friendly staff ! Great service and great food. Hard to beat such a fine family owned business. It was our daughters birthday and we had a group of 7. Everyone got their food except my husband. It came out after everyone else was finished eating. They comped his dinner but it ruined the festive feel of the night as we all felt badly eating in front of him. sauces ever! Nice bottle of wine for reasonable price. Food is always great! The bread is so fresh and keeps the kids busy. Great place to go to feel like you’re still getting An adult dinner out thanks to the vibe and live Music. Our server was a little slow and non responsive but she was a young girl so we didn’t get upset. The rest of there staff that helped us was great though. Pretty expensive for a family of 5 but food is worth it. The kids even loved all three of their picks from the kids menu. We were charged for kids milks which usually comes with the meal so that was strange but overall, highly recommend! Terrific entrees, fresh salads and warm bread plates. Excellent service and excellent atmosphere. The staff is very friendly and courteous. This is a wonderful place for lunch or dinner. Great food as always. This is our regular go to place for Italian, it doesn't disappoint. Great selection of food and wines. Excellent, excellent, excellent! Food, service, and atmosphere was excellent!!! The food was fantastic - great value and lots of selections. Took a party of 8 and everyone ordered something different and everyone thought their food was great. The service was exceptional - Allen was our waiter and he was extremely attentive. This was our first time at Giammarco’s. We sat at the high tops by the bar. We absolutely loved the feel of the restaurant. Our server was awesome, and the food was absolutely amazing. You could tell they put a lot of effort into making everything homemade. I kept telling my husband how the food genuinely reminded me of being back in Rome. The staff will wait on you hand and foot, and just wants to make sure you have a great experience while there. We will absolutely be back and hope to bring our entire family. PS. Try to Cannoli to finish out your meal. You will NOT be disappointed. Wonderful food, service and atmosphere. Pizzas, salads and pasta dishes were excellent. Always enjoy meals here. Good place to meet with friends. Food is great and service is generally on point. Great desserts as well. We enjoy dinner in The Grotto section because you can view a game on the TV's and also enjoy music, if a performer happens to be there! Service in Grotto is very good! Always friendly, courteous and polite! I love coming to Giammarco’s! It is always a wonderful experience. Excellent service and excellent food. Great atmosphere and friendly staff. Excellent food and service. The daily special - cod and chips - was delicious. The service was wonderful with Allie. She was very efficient and friendly. Great atmosphere! Wonderful pizza and salad wedge. Excellent server, Allen. He is very friendly, efficient and courteous. The food was delivered just as we ordered with the requested specifications. The staff was very friendly and the atmosphere was wonderful. Food was excellent, as always. Our server was a little off her game, but overall OK. Very excellent pasta dishes and hot bread. New server. We made a reservation for 7pm hours in advance. Still had to settle for a tabletop in the bar because no dinning room or bar booths were available. It was our waitress's first night and that needs to happen on a week night, not at prime time on a weekend! Food took too long to come out and we got it to go. Always get great service and great food. My family and I truly enjoyed our dining experience. The wedding soup is the best in the city. Staff is always friendly and professional. We will be back. Wonderful food and service. Server, Jessica, was great. Staff was friendly and courteous. Atmosphere - terrific! The Beet salad was awesome!!!!! Always a wonderful meal.